Dear Hank, compliments from Germany for your brilliant studies. Since you say the sonnets are a message for posterity – could we say that TWO simultaneous printings were meant to achieve a greater degree of certainty that copies would be preserved even if interested parties (Robert Cecil) would try to have them destroyed. Or can we draw ANY conclusion from those two printings ? I just try to understand. Thank you ! – I. Drucks. Hi Inge, thanks for the comment! Well, I think you are right. I was going to ask — and may ask on the main blog page — whether anyone knows of a similar printing of a book with two separate cover pages designating two separate sellers. I wonder if we have other examples in the reign of Elizabeth and/or James. If not, then we do have an anomaly and it might well indicate what you suggest. Thanks again. Your conclusion seems to be reasonable. Even more so, knowing the number of the surviving prints of the Quarto. Probably someone was successful in destroying the published books, and well may be that this ‘trick’ helped to survive. Hi Sandy, books to be published had to be registered in advance, there was a "Statioers Register" . Someone might have noticed and taken action – or it might have slipped attention. Those who saw the registration might have been "friends" who did not pass the information on … And Robert Cecil was not exactly popular. – You see, lots of speculation. But very intriguing, too. sandy1121 commented: "Hi Inge, Your conclusion seems to be reasonable. Even more so, knowing the number of the surviving prints of the Quarto. Probably someone was successful in destroying the published books, and well may be that this 'trick' helped to survive. What I don't"
Interesting conversation … and opening up more space for insights etc. One thing, not directly related — Venus and Adonis was so popular that, I believe, only a single copy now exists, and its pages are worn from thumbing, turning; and the existence of 13 surviving copies of the sonnets, virtually all in clean condition, no wear and tear, indicating that these copies must have been tucked away somewhere, in individual great libraries, etc., while the others may well have been taken out of circulation. Just thought I’d include this here. 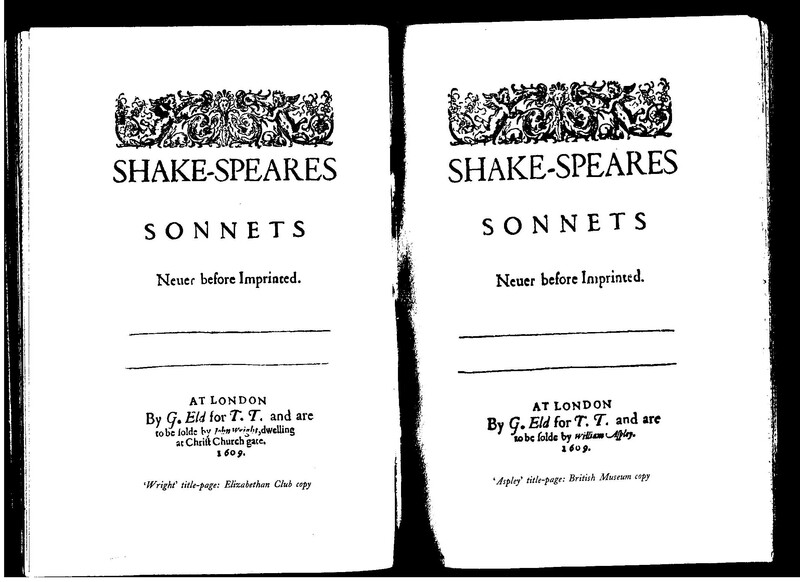 The Sonnet’s publication was not only rare. Don’t forget Jonson changed all that could indicate the Fair Youth was a man and gave then the idea it was always a woman. Could it just to erase a possible homossexual scandal or was it to make future generations don’t get the idea it was a Prince?! that is interesting, Francisco. That’s what supporters of Mary Sidney like to point out. A friend of mine recently pointed out that William Shakespeare spent 7 years at grammar school, yet we suggest he was illiterate. I couldn’t find anything about this on the internet, do you guys have any helpful thoughts? the living proof are his inconsistent, barely readable signatures. Have you seen them? Hi Sandy, there is NO proof that Shaksper went to school ! The records are lost. And : sorry about my misprint , it should have been "Stationer´s Register". sandy1121 commented: "Hi Lys, the living proof are his inconsistent, barely readable signatures. Have you seen them?" Hi Ingeborg, it was mere irony, I hope that re-reading it, you’ll see it 🙂 Thank you.